Lisa Thompson has been writing since 2008, when she began writing for the Prevention website. She is a holistic health practitioner, nationally certified massage therapist and National Council on Strength and Fitness-certified personal trainer. Thompson also holds certificates in nutrition and herbology from the Natural Healing Institute, as well as a Master of Education from California State University. For those with celiac disease and gluten intolerance, even a minute amount of gluten can present serious problems. While avoiding the obvious gluten-laden foods, such as bread and pasta, may be easy, it is more difficult to avoid drugs that may contain small amounts. Some drugs may contain gluten in the form of a filler or coating, while others may have become contaminated by equipment on which other gluten containing products were manufactured. Luckily, with awareness of celiac disease on the rise, more companies are producing gluten-free ingredients, ensuring that products are not cross-contaminated and making the public aware of their gluten free products. Keep in mind that companies constantly change the ingredients or the way in which the product is manufactured. Contact the manufacturer directly before taking a new medication. 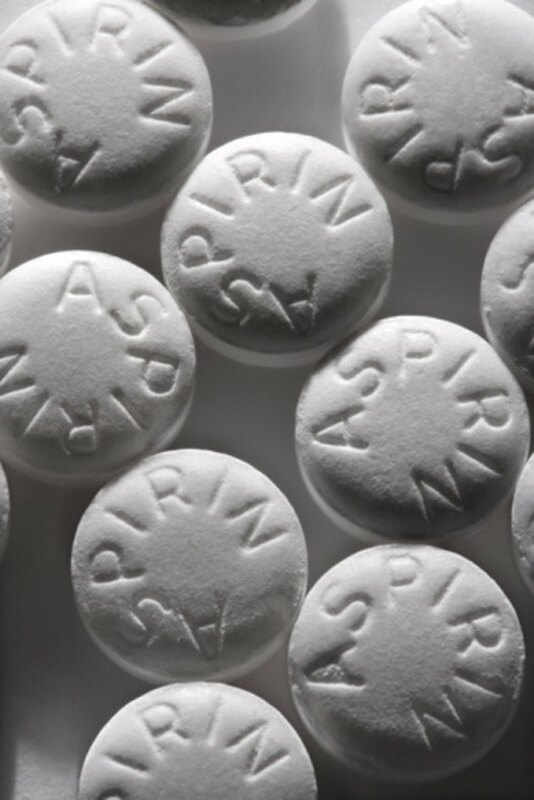 Over-the-counter pain relievers that are gluten-free include Advil, Aleve, Excedrin Migraine, Aspirin-Free PM, Motrin, St.Joseph's Aspirin, Tylenol and Tylenol PM. The following over the counter cold and allergy medications are gluten-free: Chlortrimetron, Dayquil, Excedrin Extra Strength, Hall's Cough Drops (sugar free only), Robitussin, Simply Stuffy, TheraFlu,Tylenol Sinus Severe and Vick's. The list of gluten-free over-the-counter gastrointestinal medications includes Effervescent Alka Seltzer Plus, Gas X, Extra Strength with Maalox, Imodium, Lactaid, Maalox, Mylanta, Pepcid, Pepto Bismal, Philips Original Milk of Mangesia, Prilosec and Tums (Ultra, Regular and EX). Carlson Vitamins, Vitamin Shoppe products, Dramamine, Nicorette, No Doz and Simply Sleep are also gluten-free. Because pharmacies will often substitute a generic form of prescription drugs, ask your doctor to specify a brand name when she writes your prescription. It is often difficult to find out if the generic brand of a drug is gluten-free. The following prescription painkillers are gluten free: Celebrex, Demerol, Percocet, Vicodin and Vioxx. Prescription antibiotics that are gluten free include Biaxin, Cipro, Diflucan, Flagyl, Keflex and Zithromax. Allergra, Clarinex, Tavist and Zyrtec are amongst the list of gluten-free prescription allergy medications. Abilify, Ambien, Depakote, Dilantin, Flomax, Fosamax, Lopressor, Neurontin , Ortho TriCyclen, Paxil, Premarin, Prozac, Ritalin, Welbutrin and Yasmin are also gluten free. Is Worcestershire Sauce Gluten Free? Are Reese's Peanut Butter Cups Gluten-Free? Can You Eat Sliced American Cheese on a Gluten-Free Diet?